This is way irrelevant since the CD came out almost three years ago, but I thought some of you might like to read it. Opening with the sound of a beeping heart-monitor and the line “Now, come one, come all/to this tragic affair,” My Chemical Romance’s second major-label release The Black Parade immediately sets up the listener for a dark, theatrical adventure. The listener is guided by the main character of the concept album, a freshly-deceased man the band refers to as “the patient,” as he explores his life and the mistakes and losses he experienced during it via the twisting riffs and melodies MCR uses to portray a story of fear, regret and redemption. My Chemical Romance, who are well-known for being a concept album band that is inspired by all things doom and gloom, have taken their mastery of the concept and of drama in rock music to the next level with Parade. My Chem play as their alter-ego band, The Black Parade, which they created for this album, and show an obvious commitment to the theatrical aspect of the music. At times dramatic to the brink of overkill, Parade is a definite step away from their more raw 2004 release, Three Cheers for Sweet Revenge. Flourishes such as a full marching band on the album’s first single, “Welcome to the Black Parade,” and Liza Minelli’s singing on “Mama” paired with intense guitars, and theatrical lyrics and vocal melodies point to a notable grandeur. Because of such flourishes, Parade has been compared to works by Queen and The Beatles, by whom the band claimed to be inspired during the writing process for The Black Parade. 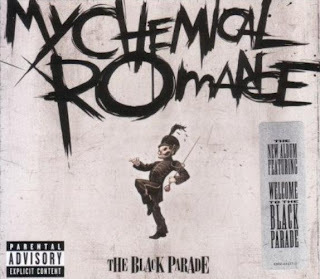 The Black Parade provides the listener with an eclectic mix of songs that range from Queen-reminiscent “Welcome To the Black Parade” to the stripped down and straightforwardly emotional “Cancer.” Through songs like “Mama,” with its sweeping choruses and epic bridge surrounded by almost cabaret-like verses, and “House of Wolves,” a song that appears to be straight from a swing club in Hell, MCR makes it clear that they were not afraid to take risks on their second major label release. True to My Chemical Romance form, hidden behind the theatrics is a message. Toward the end of the album, a there is a shift in mood from the fictional focus to themes more pertinent to the band itself and to its fans. Starting from “Sleep,” which was written about lead singer Gerard Way’s insomnia and sleep paralysis during the recording process of Parade, through the highly-emotional “Famous Last Words,” Parade gets a bit more personal. So you don't like it, or you like it the least? I love it, but out of MCR's body of work, I like it the least.